Hard to believe but removing all the bitterness aside there are relationships that are strong, healthy and nourishing for the soul. Others… they are as vulnerable as a house of cards. Certain Tarot cards, when appearing in a romance reading, could indicate that there are problems in your relationship. 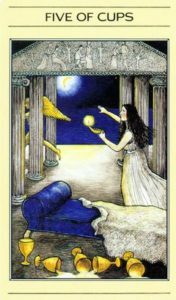 Of course, the meaning of any particular Tarot card depends on the other cards in the spread. No one single card will undoubtedly show a break up, but if you see any of these ten cards, it could be just the evidence you need to give your relationship a second look. 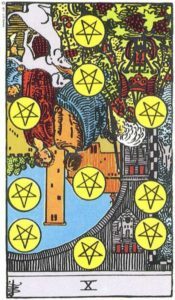 Upright, the Ten of Pentacles shows a happy family and good luck in a relationship. Reversed, it could mean an imminent romantic failure. If you are in a new relationship, this might suggest that you have doubts about it succeeding in the long-run. Your partner might not be right for you. Usually, the Five of Pentacles represents strife, either emotional or financial. It is a sign that trouble is brewing. This card signifies your relationship with money or people. Money troubles can affect many parts of your life, including romance. The Five of Cups is an image of a cloaked figure, who feels sorrow over three spilled cups. This is a serious warning. Difficulties could be on the horizon. Disappointment, a lack of satisfaction and/or unhappiness with a particular result leaves you filled with sadness. These emotions may affect your relationship. Reversed, the Six of Wands suggests that you find yourself doubting your relationship’s potential. You lack confidence and need support and understanding from those around you. You might be feeling down or as if you failed yourself or your partner. Pick yourself up and regain inner strength. 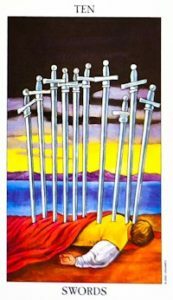 The image of the Five of Swords is a war that was bravely fought, but eventually lost. In your relationship, constant fighting and disagreements might lead to an unfortunate end. Death is the symbol of renewal and rebirth and the demise of old attitudes and ways of thinking. The Death card in a relationship reading means that you might soon hit rock bottom. Something has to end before it can be reborn. This is a sure sign that it is over. 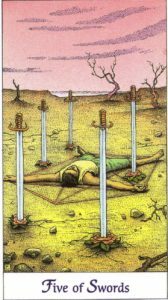 Just look at the image on the card, ten blades in the back of a vanquished foe. Talk about overkill! This suggests hurt and pain with a dramatic flair. After the break-up, it could take months, even years, to make you whole again. The darkness of the Tower indicates a significant disruption in your situation. You may be happy in your relationship. However, when this card appears, look out! Your relationship might be in trouble. 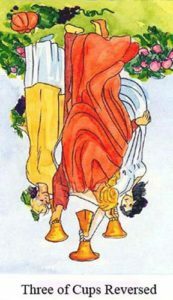 Reversed, the Three of Cups is not a strong sign for any relationship. You may have lost touch with your lover. There could have been a fight or a falling out. It can serve as a reminder that someone needs special attention from you. The Hermit is a lone, single and solitary figure. You, or your lover, may be facing separation, isolation or withdrawal. It signals a period of reflection and contemplation. The Hermit might not be an official “break up” card, but it reveals that you need some time to think over your situation.